The Redcliff Public Library’s western section of books got another great selection after the Idaho based Will James Book Gifting Program donated nine books to the library. The society’s aim is to provide written and illustrated books by Will James in the western genre for readers of all ages to enjoy stories of the real cowboy life. James was born as Joseph Ernest Dufault on June 6, 1892 in Quebec. He moved out west in 1907 at the age of 15 where he was a cowhand and where he went through a name change. He had a knack for being artistic and gained status for his sketches of life on the ranch before his first piece was published. It was in 1914 that he a turning point where he was being accused of rustling cattle Ely, Nev., and sentenced to a state prison for a year to 15 months. While in prison, his artistry side was put to use and when he was released, he became the best known western writers and artists. A U.S. company started reproducing Will James books a number of years ago, which was done very successfully, said Allen Jensen, who has been a long time member of the society and was the initiator of the first Canadian Will James Conference in Medicine Hat back in 2007. That company shifted its focus. “What the Will James Society did a number of years ago is purchase a large quantity of their stock,” said Jensen. Library manager Tracy Weinrauch said the program caught their eye when Jensen attended their book sale and discussed the program. It was after the book sale the library sent their application in and it was a couple of week ago the books arrived. “They should be shelf ready for our reception in September,” said Weinrauch. 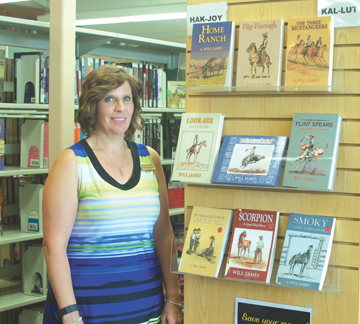 She said the library “ can’t get enough of them,” when it comes to adding to the western collection of books because of the difficulty to fund one area of genres. The reading level would be for adults, but kids ages eight to 12 can open up the cover to one of the books which includes illustration and writing. “I don’t expect them to sit on the shelf for very long,” she said. For the Will James Society, it is a requirement for the recipient of the books to have a reception to showcase the bundle. The library will showcase the novels on Sept. 9 from 1:30-3:30 p.m. and will include a showing of the film Alias Will James. Maple Creek has also received their bundle.